Michael Collins is a former American NASA astronaut and retired Major General. This biography profiles his childhood, career, life, achievements and timeline. Michael Collins is one of the three astronauts, who worked on the ‘Apollo 11’ mission, which made the first lunar landing, one of the biggest events in history of mankind. 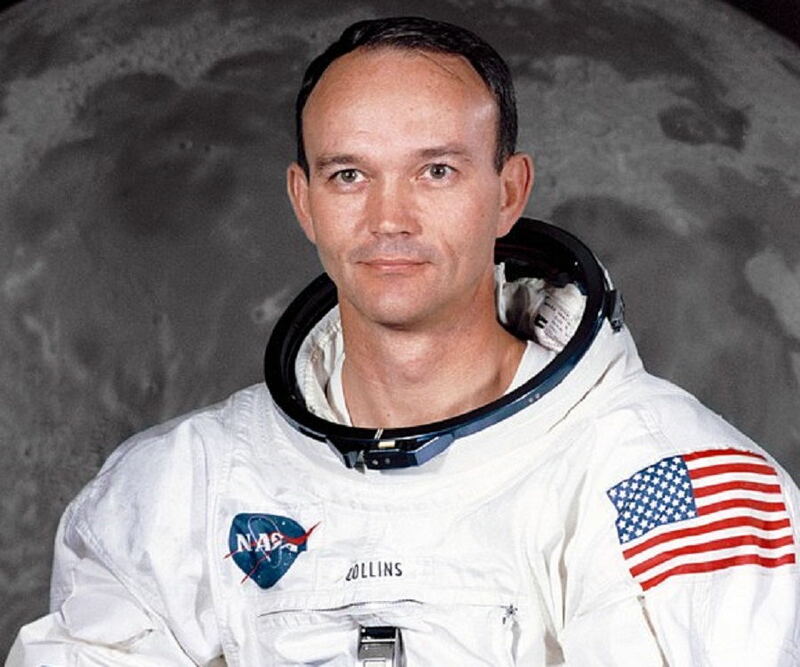 While his colleagues, Neil Armstrong and Buzz Aldrin stepped on the moon, Collins was the command module pilot of the mission, who orbited around the moon. After an initial rejection, Collins was chosen by NASA to be a part of the ‘Astronaut Group 3’. His first spaceflight assignment was the ‘Gemini 10’ mission, during which he performed the spacewalk. Michael Collins was an army man, before he joined NASA. He graduated from the United States Military Academy, after which he joined the United States Air Force and was commissioned to the Chambley-Bussieres Air Base, France. He has been the recipient of numerous honours and decorations including, the NASA Distinguished Service Medal, Collier Trophy, the Hubbard Medal and Presidential Medal of Freedom among many others. After he retired from NASA, he became Assistant Secretary of State for Public Affairs in the Department of State. He later established his own consulting business. Michael Collins was born on October 31, 1930 in Rome, Italy, to James Lawton Collins, a U.S. Army Major General. Since his father served in the army, young Collins resided in several parts of the world, including, Rome, Oklahoma, Governors Island and New York, among many others. He attended the Academia del Perpetuo Socorro in San Juan. He later attended the St. Albans School, Washington, D.C, where the family had moved during the World War II. In 1952, he graduated from the United States Military Academy, where he finished 185th out of 527 cadets. The same year, he joined the United States Air Force. He was trained at the T-6 Texan in Columbus Air Force Base, Mississippi, San Marcos Air Force Base and James Connally Air Force Base, Texas. He later flew the F-86 Sabres at the Nellis Air Force Base, Nevada, during the advanced day fighter training. He also learned to deliver nuclear weapons at the 21st Fighter-Bomber Wing at George Air Force Base, California. In June 1954, he was commissioned to the Chaumont-Semoutiers Air Base, France, the front-line air base for the United States Air Force. Once, during a NATO exercise, his plane caught fire and he had to be rescued. In 1956, he was commissioned to work in West Germany owning the Hungarian Revolution, also known as the Hungarian Uprising, which took place that year. He later attended an aircraft maintenance officer course at Chanute Air Force Base, Illinois. After the course, he worked at a Mobile Training Detachment and travelled to various Air Force bases for training mechanics on the servicing of new aircrafts. On August 29, 1960, he joined the USAF Experimental Flight Test Pilot School at Edwards Air Force Base, California, after completing the minimum requirement of 1500 hours of flying. In 1962, John Glenn’s Mercury Atlas 6 flight that circled the Earth in 90 minutes inspired him so much that he decided to become an astronaut. He applied to NASA for the second group of astronauts but was rejected. He took up a course in basics of spaceflight at the SAF Aerospace Research Pilot School, previously the USAF Experimental Flight Test Pilot School. They also flew 90,000 feet in F-104 Starfighters. In May 1963, be resumed his job as a fighter operator and in June that year when NASA called in for astronaut applications, he applied. He was selected for ‘Astronaut Group 3’ by NASA. After training in NASA for 240 hours, in June 1965 he was appointed to work on his first crew assignment as a backup pilot for ‘Gemini 7’, a spaceflight in NASA's Gemini program. After he completed his ‘Gemini 7’ assignment, he was assigned to work as a prime crew member in ‘Gemini 10’ along with John Young. After much training, he performed a spacewalk on the assignment. He was the backup crew for the second manned Apollo flight but this was cancelled as it was similar to the previous Apollo 1 mission. After the cancellation, the crew were reassigned and he was promoted to the rank of command module pilot. In 1968, he worked as the capsule communicator for the ‘Apollo 8’ mission and was responsible for communicating directly with the crew. This was the first spacecraft to reach the moon and return. In July 1969, he went on the ‘Apollo 11’ mission, which landed the first humans on the moon. He was the third member of the mission and commanded spacecraft alone in the lunar orbit. 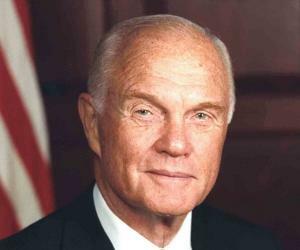 In 1970, he retired from NASA, after which he worked as the Assistant Secretary of State for Public Affairs in the Department of State. He later became the director of the National Air and Space Museum and until 1978 he held this position. He became the under secretary of the Smithsonian Institution and in 1980, he was appointed as the Vice President of LTV Aerospace. In 1985, he found his own business, consulting firm, Michael Collins Associates. In his lifetime, he flew into the space twice. His first spaceflight was for Gemini 10 wherein he performed two rendezvous with different spacecrafts. His second spaceflight was for Apollo 11, wherein he was command module pilot. It was the first manned landing on the lunar surface. While he orbited the moon, his fellow space colleagues Neil Armstrong and Buzz Aldrin walked on the moon. He was awarded the Air Force Distinguished Flying Cross, Congressional Gold Medal, NASA Distinguished Service Medal, Air Force Command Pilot Astronaut Wings and Presidential Medal of Freedom. In 1969, he was the recipient of the Collier Trophy, an annual aviation award, which he received along with Neil Armstrong and Buzz Aldrin. In 1970, he was bestowed the Hubbard Medal by the National Geographic Society. In 1999, along with Neil Armstrong and Buzz Aldrin, he was awarded the Langley Gold Medal by the Smithsonian Institution. In 1957, he married Patricia M. Finnegan, whom he met in an officer’s mess. The couple have three children together. He was a heavy smoker. Around 1962, he decided to quit smoking. In 1968, he experienced many problems with his legs, which was later diagnosed as cervical disc herniation. He was operated for the same. It took him three months to recover and this made him miss the 'Apollo 9' mission. In 1970, the English rock band, ‘JethroTull’ named a song , ‘For Michael Collins, Jeffrey and Me' from their album, ‘ Benefit’. 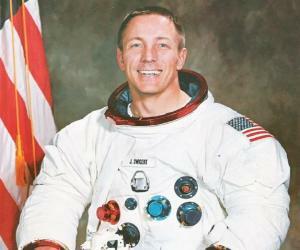 In 1974, his autobiographical book, ‘Carrying the Fire: An Astronaut's Journeys' was published. He has also authored the books, ‘Liftoff: The Story of America's Adventure in Space’, ‘Mission to Mars’ and ‘Flying to the Moon and Other Strange Places’. He has been a Trustee of the National Geographic Society for a long time. He is currently the Trustee Emeritus. 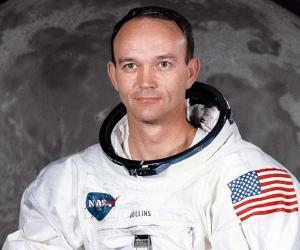 In 1996, he was portrayed by actor Jim Meltzer in the film, ‘Apollo 11’. He was also the inspiration behind the miniseries, ‘From the Earth to the Moon’ and the TV movie, ‘Moon Shot’. In 2007, he was seen in the documentary film, ‘In the Shadow of the Moon’. He also made a contribution to a book of the same name. In 2010, he played a minor role in the coming of age film, ‘Youth in Revolt'. This American astronaut served as the command module pilot for Apollo 11 mission, which was the first manned mission on Moon. While his fellow space crew members walked on the moon, he orbited around the lunar body.